How long do you have to engage a customer on your website? I’ve heard as little as 1.7 seconds, usually it’s around 7-10 seconds and by 59 seconds your time is UP! On page SEO (search engine optimisation) is essential, but it must be the right search terms. Explained simply, SEO is the search words that accurately describe your business used correctly on your website in the right way. An expert researches which words are being used and how often to make sure the ones that are most searched are on your site. This isn’t just a matter of saying the same thing over and over, as this works against you. At Digital Copywriting we always do SEO research for our copy writing, but SEO is now so complex that it’s a full time job for many companies and certainly when I need more help I use Mad Scientist Digital. Google likes you to state clearly what you do, with accurate spelling and grammar, in a unique way. Simple copywriting involves using the key words that match your website, creating a good user journey and creating trust. If you use unrelated key words and have poor quality links, Google can actually remove your website altogether! An essential part of the ‘simple copy’ journey is the outcome. If your website doesn’t give the reader every chance to take action, through phone calls, emails, links to external sources for verification or your own social platforms, you’ve missed the boat. A sales focussed copy writing approach is essential for you to have a website that actually works. Creating website trust is about knowing how to create good quality external links. The text used to describe the links matters. Broken links, grammatical and spelling errors de-rank you. In addition to this I often see clients who have social links that still have numbers after them. You need consistent URLs, with no numbers and links to external trusted sites such as Huffington Post and government sites. If you have questions and no time, engage a digital copy writer with a sales focussed approach. With copywriting one of the hardest things to get right, it’s also one of the most crucial factors in being founds, so my advice is don’t take any shortcuts. Employ a copywriter that has the expertise and takes the time to you look amazing online. 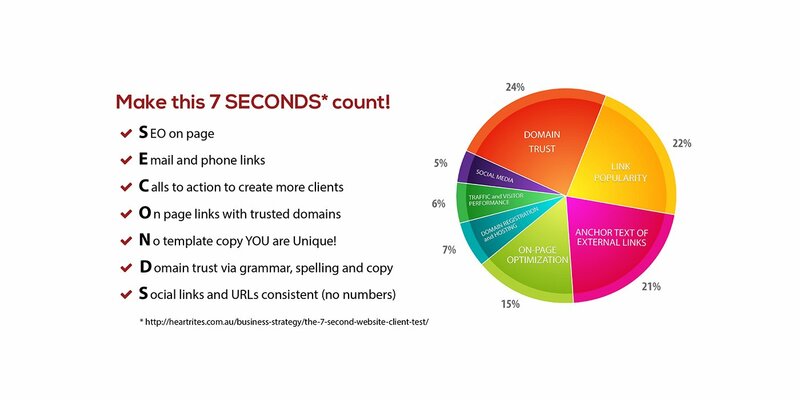 Click HERE to download the .pdf if you would like to know how to make just 7 SECONDS count for your business. Just realised you need an update but no time to do it? Click HERE to find out more about our simple website copy update package done for you within 1 week. pleased to read all at one place.